Cycling problems? The VMOS™ brings the discipline your rifle needs. This carrier group includes our proprietary bolt design, the JP EnhancedBolt™. Superior in every way to standard bolts, it's manufactured from SAE 9310, providing drastically extended lifespan with design improvements that ensure superior function. Our proprietary bolt design, the JP EnhancedBolt™ is superior in every way to a standard Mil-spec bolt. Manufactured from SAE 9310, it has a drastically extended lifespan while design improvements ensure superior function. This high pressure .308 model is designed to open up reliable function of AR platforms with over-pressured loads such as 6.5mm and 6mm calibers. This is achieved through use of a reduced diameter firing pin orifice that precisely accommodates the tip of the included low mass firing pin. The EnhancedBolt™ is compatible with the JP LRP-07™ and the DPMS LR-308 platforms (or clones thereof) only and cannot be used to replace bolts in the Armalite AR-10 platform (or clones thereof). Package includes carrier, EnhancedBolt™ assembly, cam pin, firing pin, firing pin retainer pin and instruction sheet. The JP .308HP bolt does not allow for the use of excessive pressure, overloaded ammunition that exceeds SAAMI specifications. When evaluating new ammunition, always start on the low- to mid-range of any published load data and work up. A good indicator of working pressure is the primer retention on the subsequent loading of a case. A noticeable loss of primer pocket tension indicates that your ammunition has excessive pressure and has overworked the case. Be aware that these receiver platforms are not standardized like the AR-15/M16 platform for which most parts are cross-compatible. Before ordering accessories and parts for your large-format rifle, make sure the parts are compatible with your particular platform. 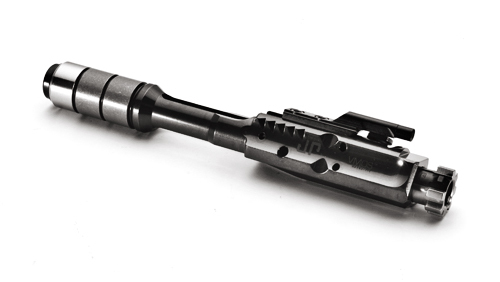 This bolt carrier group is compatible only with the DPMS family of AR-10 products. With the Armalite/Rock River family of large-frame receivers, this carrier can only be used as a complete bolt carrier assembly group with a DPMS-pattern bolt such as our .308 JP EnhancedBolt. Interchanging individual components will result in an unsafe configuration. Do not under any circumstances mix and match components between the platforms.